Iowa Pork Producers Association staff fired up the grill to feed volunteers at a Central Iowa Chapter of the American Red Cross project at the Iowa State Fairgrounds in Des Moines on April 28. 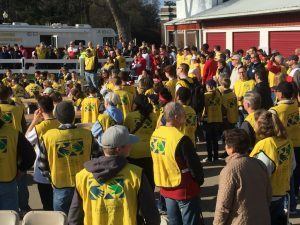 Nearly 300 Red Cross volunteers fanned out around the fairgrounds neighborhood to replace and install as many smoke detectors in a home as necessary for homeowners who indicated interest in the project. The Central Iowa Chapter set a project goal of 1,150 smoke alarm installs and 721 were actually installed on the day. IPPA sponsored the lunch for the volunteers and grilled and served 325 pork burgers and other food at the Iowa Pork Tent as a community service project. “We really appreciate the great work that the pork producers do in helping partner with us and we’re really excited,” Struck said. The Red Cross works closely with Polk County Emergency Management, the Des Moines Fire Department and other organizations on the project and aims to serve areas of greatest need.